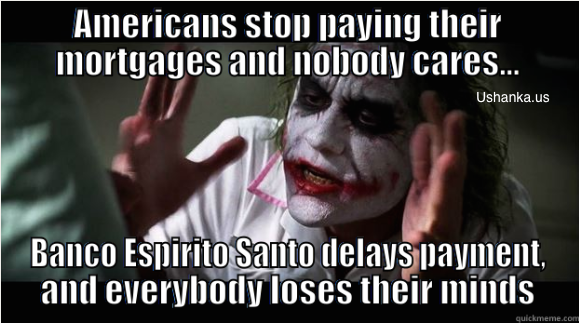 Portugal's primary lender, Espirito Santo International SA (ESI) missed a loan payment this week. Cue the doomsdayers in 5...4...3...2... They 'told you so' for the past year as the Dow climbed to 17,000. Obama's media is reporting "accounting irregularities." It is just a late payment. Nothing to see here. Here is what I know: Both sources for economic news are wrong. I read both daily and try to find the truth. I have yet to find a reasoned, objective and responsible source for financial news. If such a source existed, professional investors wouldn't hedge. Right? Not the source for objectivity by any means, but the blind squirrel at ZeroHedge does find a nut every now and then. As do the optimists in the mainstream finance outlets. Here is a graph from MarketWatch. Up is bad. But 4%? Up from 3.5%? Not bad at all. 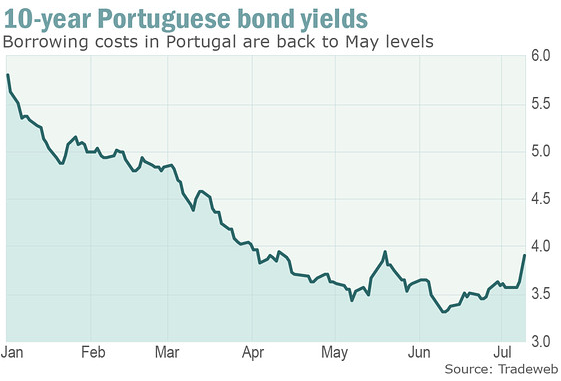 Not panic-worthy, assuming Portugal can afford to make its payments at 4%. No one has the answer to that. There is no media or blog source that can answer our questions accurately, because they'd all be dismissed as fools. Who is going to answer these questions and retain credibility: Is this decline reversible? What is the point of no return? What defines "collapse." When will it happen? What will it look like? What are the likely (not desired) remedies the government will attempt? Etc. And here is the question du jour, albeit hypothetical: what will happen if it becomes fashionable for banks and nations to skip loan payments? One little gem I found in my current studies of the gold standard: Hong Kong has no debt. Just curious: what's your beef with Zero Hedge? Thanks for commenting Comrade RobertW. Just what I said, nothing more. They present the pessimistic view. Everyday the sky is falling. 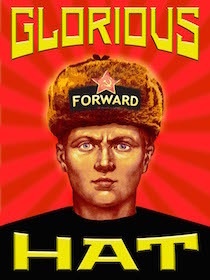 That is their theme, just as Ushanka's is: there is a communist-inspired infiltration in the US government. I visit ZH daily - I just don't swallow everything whole. Something that has bothered me about this Portugal thing is that we were told by ZH and others back during Cyprus that Portugal or Italy were the next "dominoes" to fall. That was correct - both countries were and are in dire straights. While I cannot say if ZH was implying an immediate crisis in either country, I inferred it from their reporting. Make sense? It does not take 15 months for a domino to fall. Yes it does, thanks. But what is keeping the damn thing running? It will take better minds than mine to figure that out. How long can a system continue where the number of people paying into it is becoming a minority? Who knows. Classical Rome obviously took a couple of centuries to finally collapse. (How long, of course, can be debated for a long time as well.) The Soviet Union started collapsing the day it was founded, but it still took almost seventy years for it to collapse under its own weight. I hear you Comrade RobertW, and fully agree. Can't answer your question as to "when?". If a steady decline is in the works, I'd suggest we are already in it and it will be obvious in hindsight as we get further down the road. If a collapse is in order, I have decided to not trust anyone with that answer. I think the only ones who give a date for collapse are just attention-seekers. I listen to what they say, and none have produced convincing evidence. Great reference to the Soviet Union. That was a fascinating lesson on how not to govern. Hopefully it won't take another 100 million dead to learn from today's mistakes. Amazing content for the finance. I also share our experience. I am using for the accounting and finance Quickbooks Accounting Software. Its very good software maintain my all expense bills and other business accounting work..